The Florida Fish and Wildlife Conservation Commission (FWC) announced a record year for the number of green sea turtle nests in Florida. FWC staff documented approximately 39,000 green sea turtle nests, based on 27 Florida index beaches used to assess nesting trends. Nearly 30 years ago, only 464 green sea turtle nests were recorded on the 200 miles of beaches that are part of the Index Nesting Beach Survey. By 2011, the count was up to 10,701 green sea turtle nests; in 2013, it was 25,553 nests; and in 2015, it was about 28,000. The counts on index beaches represent about 68 percent of green sea turtle nests statewide. Green sea turtles nest more abundantly every other year, which contributes to the two-year spikes in their nesting numbers in Florida. Green turtles, named for their green body fat, were valued by European settlers in the New World for their meat, hide, eggs, and "calipee" (the fat attached to the lower shell that formed the basis of the popular green turtle soup). Merchants learned that the sea turtles could be kept alive by turning them on their backs in a shaded area. This discovery made it possible to ship fresh turtles to overseas markets. 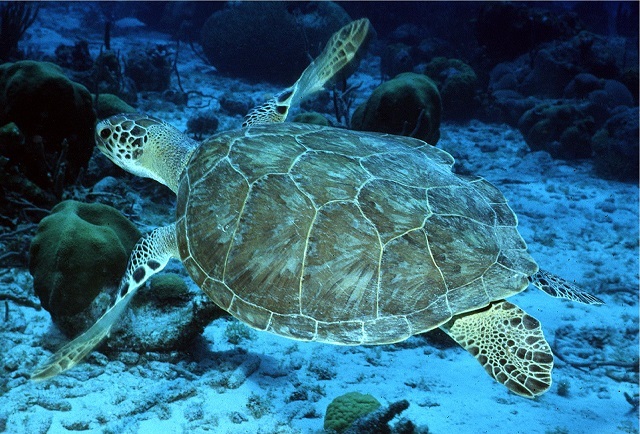 By 1878, 15,000 green turtles a year were shipped from Florida and the Caribbean to England. The final 2017 sea turtle nesting numbers from the FWC’s more comprehensive Statewide Nesting Beach Survey, covering 800 miles of Florida coastline, will be available in early 2018. 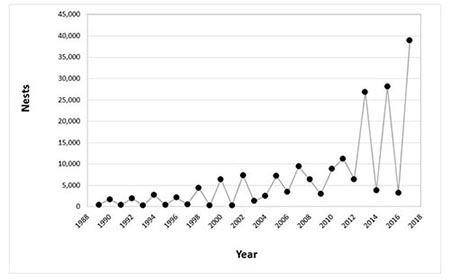 Preliminary data, based on the recently completed Index Nesting Beach Survey, indicates the trend for green sea turtle nesting has experienced significant increases over the past 27 years.